A new report from Reuters claims that Amazon is planning mapping tech for the next Kindle Fire tablet, likely the Kindle Fire 2. But despite the Kindle Fire tablets running on a version of Google's Android OS, Amazon decided to go with Nokia's maps instead of Google's, claims Reuters. Amazon's Kindle Fire runs on a stripped-down version of Android that does away with all of Google's apps, and the companies would have to make a separate deal to bring Google Maps to the Kindle Fire 2. Instead, it seems Amazon's going with Nokia's mapping until it can get an in-house solution going. And make no mistake: Amazon almost certainly does have an internal mapping solution in the works. The online retailer purchased 3D mappers UpNext in July, and you can bet they're not just going to sit on that technology. The only question remaining is how long until the partnership with Nokia dries up, because that's when we're likely to see Amazon Maps take off. The Kindle Fire 2 could launch as soon as next week, if reports are to be believed. Amazon has a press conference scheduled for Thursday, and TechRadar will be in attendance to report all the Kindle Fire 2 news. The Kindle Fire 2 is expected to launch at the same $199 price point as the current Kindle Fire. Other rumors hint at a bigger screen, with some sources predicting a display as large as 10.1 inches. 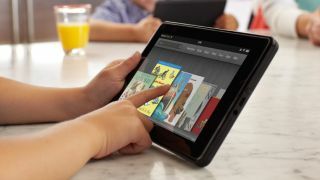 No matter what form the Kindle Fire 2 eventually takes, all will likely be revealed on Sept. 6.